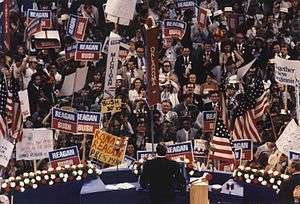 Ronald Reagan addresses the 1980 GOP convention. Reagan saw a big boost in the polls after his acceptance speech, but his opponent, President Jimmy Carter, got an equally large bump after his convention four weeks later. A convention bounce or convention bump refers to an increase in support that U.S. presidential candidates in the Republican or Democratic party typically enjoy after the televised national convention of their party. A presumptive nominee for president may also be said to experience a "VP bounce" after announcing his or her pick for vice president prior to the convention. The size and impact of convention bumps vary, but presidential candidates usually see at least a small uptick in their polling numbers coming out of their conventions which has been attributed to party unity in the aftermath of a Presidential Primary or for voters of the then incumbent party to a resurgence in interest in the election and a drop in apathy that might have resulted from winning the prior election. Bill Clinton benefited from one of the largest bumps in history after the Democratic National Convention in 1992, climbing by as many as 30 points in the polls,. Then-President George H.W. Bush's convention bounce was weak by comparison, some party leaders blaming former primary challenger Pat Buchanan's fiery and divisive speech, which aired in primetime due to a scheduling delay. Four years later, Bob Dole got a big bounce after the Republican convention, but quickly fizzled. However, Al Gore's 2000 bounce endured for weeks. Prior to the Democratic convention, Gore was behind Texas Gov. George W. Bush by as many as 16 points, but was in a statistical tie with the Republican the weekend after his acceptance speech. To the bafflement of political pundits, Democratic candidate John Kerry did not get a convention bounce in 2004, despite the unpopularity of incumbent George W. Bush. Polls indicated a small bounce for 2008 Democratic presidential nominee Barack Obama after his party's convention in August, but as expected, much of it evaporated during and after the Republican convention the week following, yielding GOP candidate John McCain a small lead in several polls. Nielsen ratings revealed that year's party conventions to be the most-watched ever, with the Republican convention narrowly trumping the Democrats'. The RealClearPolitics polling index revealed the 2012 convention bounces for President Obama and GOP challenger Mitt Romney to be comparably smaller than in past elections. Though Romney pulled even with Obama during that year's Republican convention at the end of August, Obama opened up a three- or four-point lead during the Democratic convention the week after. In 2016, news sources and polls differed greatly on the size of the convention bounces received by Donald Trump after the GOP convention in Cleveland and by Hillary Clinton after 2016 Democratic National Convention in Philadelphia. For Trump, CNN, via its polling, reported Trump gaining a 6-point bounce, the first major convention bounce in CNN's polling since the 2000 election, when Al Gore and George W. Bush both had an identical 8-point bounce following their conventions. NBC, however, reported no bump for Trump following the convention, via its NBC News/SurveyMonkey poll. For Clinton, CBS polling revealed a four-point convention bounce, RABA Research reported a ten-point convention bounce and CNN reported a 13% bounce. ↑ "U.S. Elections Glossary & Terms". All American Patriots. September 2004. Retrieved 2009-06-20. ↑ AP: Post-convention bounce averages 10 points Archived September 2, 2008, at the Wayback Machine. 1 2 Gore Gets Convention Bounce, but Will Fickle Figures Last?. New York Times. 2000-08-23. ↑ Convention Bounce Gives Gore 5-Point Lead. ABC News. 2000-08-21. 1 2 General Election: Romney vs. Obama. RealClearPolitics. Retrieved 2012-10-08. ↑ Agiesta, Jennifer (July 25, 2016). "Donald Trump bounces into the lead". CNN. Retrieved July 25, 2016. ↑ Hartig, Hannah. "Poll: No Post-Convention Bounce for Donald Trump". NBC. Retrieved 1 August 2016. ↑ Rappeport, Alan (1 August 2016). "New Poll Reflects a Post-Convention Bounce for Hillary Clinton". The New York Times. Retrieved 1 August 2016. ↑ Walker, Tim (30 July 2016). "Hillary Clinton gains 10 points in first post-convention poll". The Independent. Retrieved 1 August 2016. ↑ "CNN/ORC Poll" (PDF). CNN. 1 August 2016. Retrieved 2 August 2016.